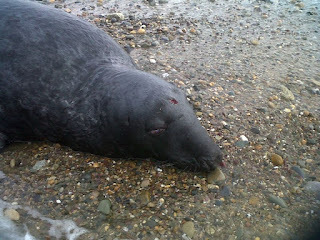 Irish Wildlife Trust...Waterford Branch: Investigation into Waterford seal slaughter? The IWT deplores the wanton destruction of our wildlife following confirmed reports that two grey seals had been shot in the head near Tramore, Co. Waterford sometime on Tuesday February 21st. These animals suffered a horrible death having swam ashore with awful head injuries. They were later euthanized under veterinary supervision. Aside from the terrible cruelty of this act our seals are protected by law under the Wildlife Act 1976 (as Amended 2000). They are also protected under Annex II and IV of the European Habitats Directive. The IWT is now calling for a full investigation by the National Parks and Wildlife Service and the Gardaí into this illegal act. Those responsible must be brought before the courts to demonstrate that the law will be upheld and such barbaric acts will not be tolerated. ...even made it on to BBC news here.